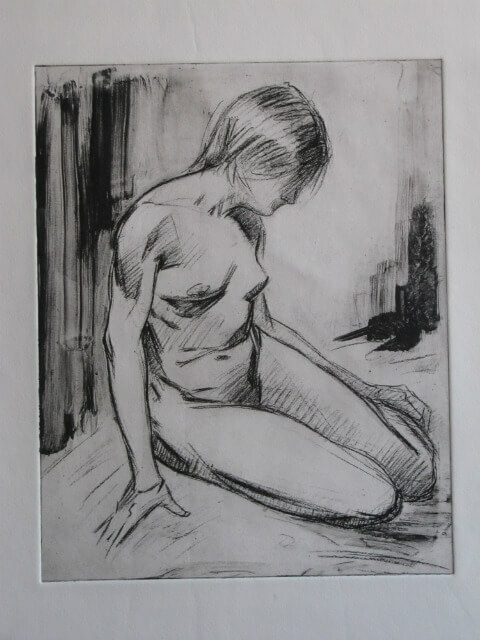 As any artist will say, it is very difficult to sell works on paper especially drawings and especially charcoal drawings. I love the effect of charcoal because it gives a drawing a more painterly look. One is able to lay-in the masses quickly and retain a wonderful airiness. So over the years, I have sought to carry this effect into a more permanent form through printmaking. It allows one to draw and add some permanency to the final product. 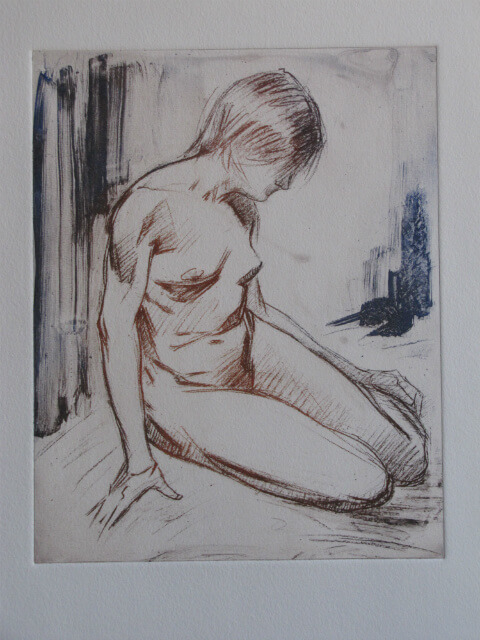 I have experimented with several types, relief print, lithography, monoprint and the combination of the last two. Lithography has given me the most satisfaction because I can combine a painterly wash with a very accurate drawing. The final effect is a unity between the two that is very satisfying that goes beyond a simply rendered drawing. 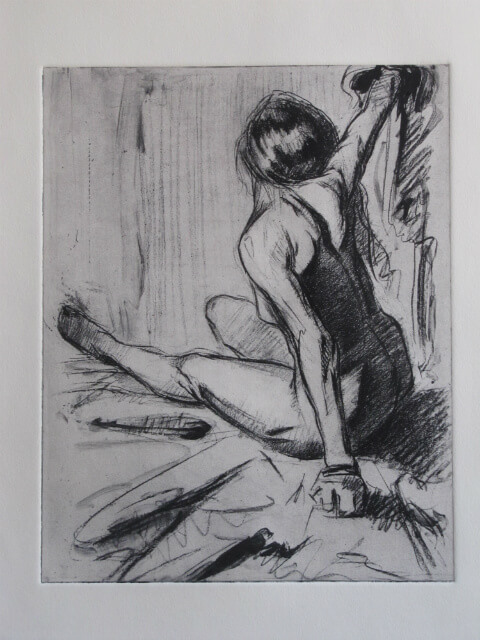 The greatest draw-back with lithography is that it is a very difficult medium to use and takes a lot of technical knowledge in regards to the craft. One not only has to be an exceptional draughtsman but must have a serious amount of technical know-how as well as a reservoir of patience. Since one draws on an actual slab of limestone, which is a wonderful surface to work on, the weight, portability and sensitivity of the stone is a serious factor. I can’t tell you how many times I have worked hours on a stone, to find out that there is some unseen flaw that only appears after it has been etched. The stone is also very temperamental. If it is too humid or too hot one day, the printing itself becomes impossible to control. It just won’t print! So as you can imagine, I have been seeking alternative printing methods that fulfill my vision of delicate drawing and painterly washes united as one through the print. I attended a workshop at The Woodstock School of Art taught by Kate McGloughlin. The course was on solar printmaking and it took place the last week of March. I was happily surprised by the results. I was able to achieve a similar look to my lithographs using a solar plate. The entire process is much more simple. 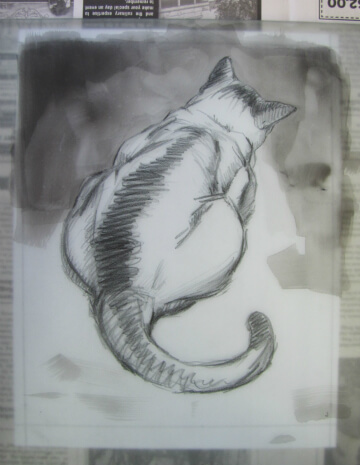 One basically draws on acetate or Dura-lar with a Stabilio “all” pencil. I produced sketches specifically in preparation for the plates in my sketchbook. I then used a Canon toner copier and Xeroxed the image onto the acetate(3M). Then, I reworked the image with the “All” pencil and added washes with a dense black ink, Pro Black, and rubbing alcohol. I found the texture on the 3M copier acetate excellent with a small tooth to it. It gave a similar resistance as the limestone. I also, experimented with drawing on ground glass (220 grit) with the same pencil and washes produced with the Pro Black and water. This felt exactly like the limestone, so much so, that this might be the material I will use exclusively. After developing the image, making sure it is dark enough( one can analyze the density of the image by looking at it on a light box), I went on to expose the drawing to the solar plate. I used a specifically designed light box for solar plate so the timing of the exposure was very accurate (one can also use the sun, itself, but the timing is not as accurate). I exposed the plate first to a Mezzotint screen that allows for the plate to be sensitive to half tones. The timing is 1.5 minutes. Secondly, I exposed the drawing, media side down (so the image is reproduced in its proper orientation), to the plate for 1 min. With the plate exposure complete one, then, washes it out for 5-10 min in a water bath until you can feel the image surfacing on the plate. It is then blotted with newsprint and hardened under a lamp for 10 min. Now it is ready to ink just like an etching plate. I inked my plates in several different methods and colored inks. 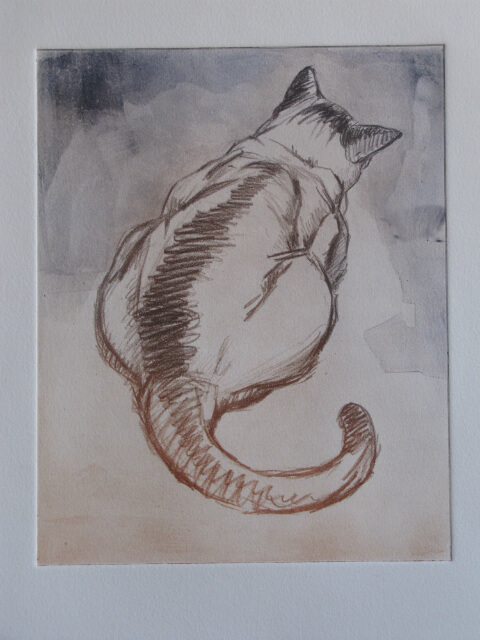 I began with carbon black intaglio ink, Akua brand. Following the same method as etching, I applied the ink with a foam board strip, making sure it penetrated the lines in the plate.I then wiped the plate with tarlatan to remove excess ink. I buffed the plate further with newsprint topped with an eraser to ease with the wiping. I then buffed the light areas with a little tissue paper to make sure they would appear white in the print. I soaked the paper, Rives heavy weight or BFK, for several minutes. I then prepared the press with the registration marks for the plate and the paper. I laid the plate on the bed and then aligned the paper, placed a cover sheet over everything, then the blankets and then finally ran the plate through the press. Another method that I tried and liked was applying the ink in two colors, alla poupee. In this method one applies the colored ink separately in specific areas to get a certain effect. I worked two plates using ultramarine blue and burnt sienna. In the cat print, I used the warm sienna in the foreground and applied the cool blue to the background and used a combination of the two for the middle area. I wanted to achieve a feeling of spatial movement through color temperature. I followed the same method on the seated figure, but allowed the figure to be warm, the background cool and the foreground a mid-tone. I found this method particularly satisfying. It gave the look of an etching with just a hint of color. The combination of the sienna and the ultramarine also gave a dark that was near black. 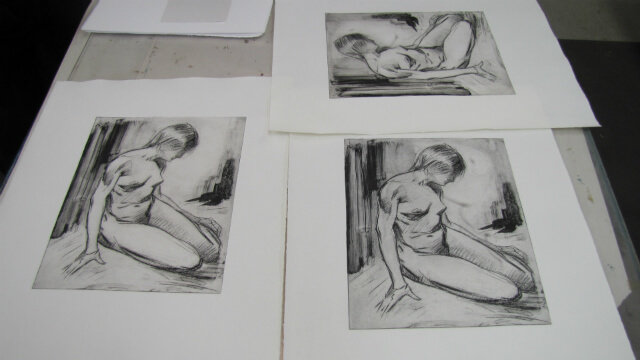 I attempted some monoprint combinations and a glazing roll, but found the over-all look not as satisfying. I preferred the print to look like a print rather than a substitute for painting.